This is the best built Self Totaling 100 employee time clock for all conditions. We are a REPAIR SHOP, too! 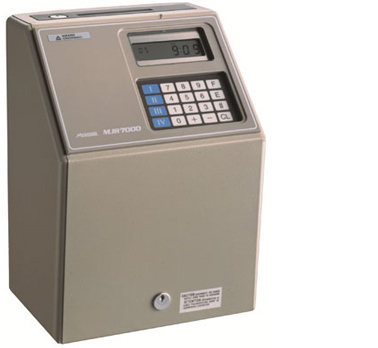 Amano MJR7000 employee time clock. button-for-button, or walk you through it over the telephone. We have personally installed several hundred of them since 1991. We are an Amano Dealer Service Center. We know these machines from top to bottom. We can tell you exactly how to program them. most popular calculating time recorder in anywhere. Unbelievable quality - this is the best! Updates for daylight savings, months, leap years, etc. ----- example, auto-deduct 30 minutes if they don't clock out for lunch. We have them in medical offices, machine shops, stadiums, and on farms. 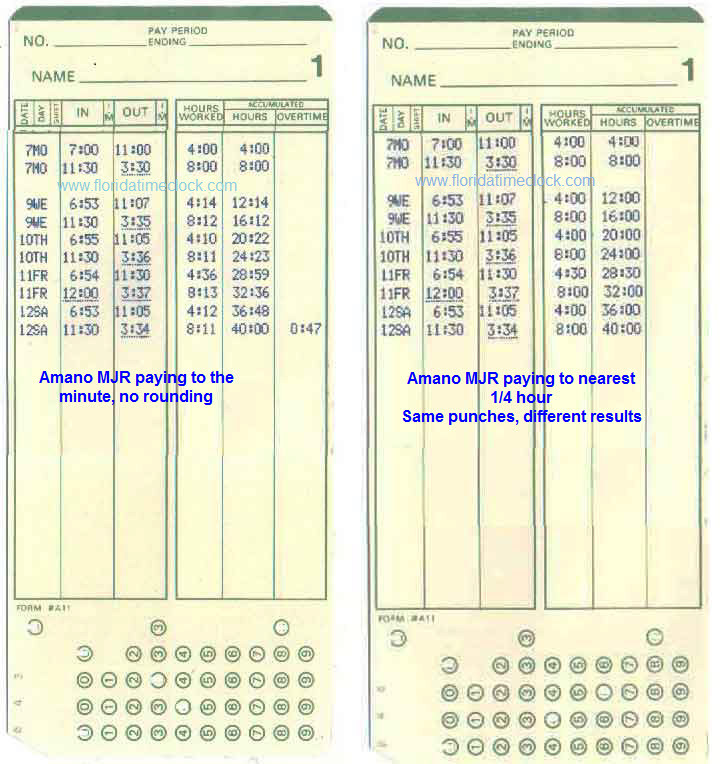 Quarter-hour time card rounding "Example"
In the cards below, you will see how the totals are different, because of the simple, fair, and legal quarter hour rounding rule. In the example on the left, the employee took home almost another hour of pay. On the right, with 1/4 hour rounding, it didn't happen. Also note that THE PUNCHES ARE THE SAME ON BOTH CARDS. Call us, we want your business.